Shelly had surgery on Monday. Nothing life-threatening, and she's doing fine, though still a little slow, unsteady, and easily tired. Perfectly normal for post-surgery. It was supposed to be day surgery, where she'd go home on Monday afternoon, but you can't go home after surgery until you've voided your bladder, and hers wasn't playing along. So we slept in the hospital that night. It wasn't real comfortable, but I'm pretty sure she was more uncomfortable than I was. And I had to hold her hand through several undignified procedures on Tuesday before things were good enough for her to be released. It was a happy evening, Tuesday, being at home. Wednesday, I worked a few hours on our side of town. Thursday, I took her in to her office for a wellness screening (irony!) that couldn't be postponed, took her back home, and went to my normal office. Today, I'm working on my side of town, which is usual for Fridays. She's making fairly steady progress at being more mobile and going longer between needing to rest. Meanwhile, I'm handling most domestic issues (which, again, is not to say that I want to change places with her). Well, the ones that are being done. Which is to day that the place is something of a wreck. But we're both eating, sleeping, and taking care of personal hygiene, so it's not too bad. She told me I've done a good job taking care of her, so I'm pretty happy. Sheesh, the primary purpose of this blog is to announce when I've got a performance coming up, and I just let this one sit and wait until I had something to write about it. Bach Choir, orchestra, and soloists. We'll be singing a Bach cantata, a little Telemann, and a piece by Hiller. Guest conductor Gotthold Schwarz (who speaks virtually no English) has whipped us into pretty good shape. So it should be worth a listen. The pipe organ at the church was damaged by hurricane Ike, so it won't be in use until next year. The orchestra is playing on period instruments (i.e., the forms the instruments had when Bach was composing), which is both interesting to see and to hear. 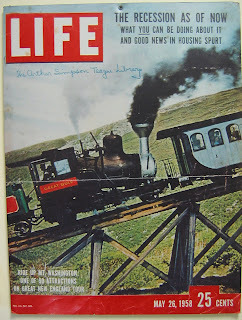 This magazine cover was on the wall at the train station for the Mount Washington Cog Railway. If our economy were a mountain-climbing train, it would be heading down the mountain. Not on the rails, because the trestles collapsed. Anyway, I'm looking for a "housing spurt" any day now. And Vermont and Maine. But mostly New Hampshire. We did many things and took many pictures, and they'll appear on our website when we've done all the necessary editing. 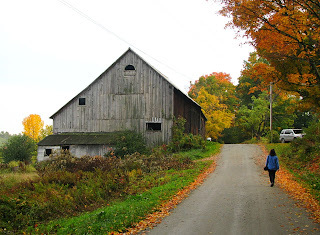 For now, here's a nice shot of Shelly walking up the road by the Norwich B&B, where we stayed our first night.